Los Angeles: A patchwork megalopolis defined by its unlikely cultural collisions; the city that raised and shaped Roy Choi, the boundary-breaking chef who decided to leave behind fine dining to feed the city he lovedand, with the creation of the Korean taco, reinvented street food along the way.Abounding with both the food and the stories that gave rise to Choi's inspired cooking, L.A. Son takes u… s through the neighborhoods and streets most tourists never see, from the hidden casinos where gamblers slurp fragrant bowls of pho to Downtown's Jewelry District, where a ten-year-old Choi wolfed down Jewish deli classics between diamond deliveries; from the kitchen of his parents' Korean restaurant and his mother's pungent kimchi to the boulevards of East L.A. and the best taquerias in the country, to, at last, the curbside view from one of his emblematic Kogi taco trucks, where people from all walks of life line up for a revolutionary meal.Filled with over 85 inspired recipes that meld the overlapping traditions and flavors of L.A.including Korean fried chicken, tempura potato pancakes, homemade chorizo, and Kimchi and Pork Belly Stuffed PupusasL.A. 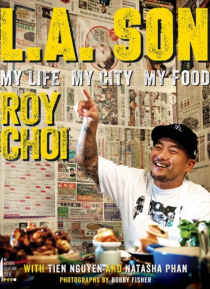 Son embodies the sense of invention, resourcefulness, and hybrid attitude of the city from which it takes its name, as it tells the transporting, unlikely story of how a Korean American kid went from lowriding in the streets of L.A. to becoming an acclaimed chef.